These raspberries aren’t just any old raspberries. They are incredibly special. They tell a story, one that is more than half a century old, one that has passed from generation to generation, and continues to do so to today. These raspberries have been the start of many memories, family stories told time and time again. As a child, along with my family, I would visit my Great-Aunt Teresa (whom we called “A Zia,” meaning The Aunt or That Aunt in our dialect). For years, I couldn’t tell the difference between her and Mother Theresa; I thought they were one in the same. Little did I realize until I was older, however, how accurate my childhood comparison really was. A Zia was amazing, in every sense of the word. A strong, selfless woman with a heart as big and compassionate as her perseverant spirit. It is because of A Zia that I am here in the United States. It is because of her brave decisions, bold sense of adventure, and loving nature that I am who I am today…this hybrid of culture, a juxtaposition between Italy and America, influenced by both, in love with each. A Zia moved to the United States first, with her husband and children, eager to seize the American Dream, for a better life, than what was, in pre-WWII Calabria. Eventually, she arranged for her sister, my Grandmother, and my Father and several of my Aunts to move to America in the early sixties, years after she suffered loss, survived a catastrophic shipwreck, and worked relentlessly to make everyone around her happier. My Father was a teenager, single and wild-eyed in a new world, and after living in America for several years, he returned to Italy to visit his brother and sister who remained there, and on that trip, he fell in love with my Mother. They got married, moved to America, and had us kids. And so I was. Our trips to A Zia’s house were magical, something I always looked forward to for so many reasons. She was always baking, cooking, gardening, and I always knew what was in store for me on each and every visit. The drive would take about 30 minutes, and as a child, it seemed like forever. But once we got to A Zia’s house, she would greet us on the front porch, arms open wide. Before I could even walk through the door, she would begin rattling off the day’s selection of soda-pops, home-made cakes and pies, and more often than not, she always had Calabrese Stuffed Eggplant (click here for my recipe). While we ate, I would, each and every visit, ask A Zia to recount her survival tale aboard the ill-fated Italian cruise liner, The Andrea Doria. I’d sneak morsels of homemade greatness in between harrowing details of this first-hand account of one of history’s most popular post-Titanic ship catastrophes. It made A Zia happy to see others eat. You could just tell from the look in her eyes. To be respectful and demonstrate the manners my parents instilled in me, I would sometimes refuse a treat or two when A Zia would ask, “You want another piece of cake or pie?” I would respond, wanting another piece, but with timid gratitude, “No thank you, A Zia, that’s okay.” Immediately, without flinching, she taught me a lesson early on so that we wouldn’t have to repeat this dialogue over and over as I got older. “If someone offers you something, and you want it, take it and say thank you. You may not be asked twice.” She was right, and would go on to say that if someone is offering you something (especially to eat), they offered it to you because they want you to have it. If they offered it just to be polite, they shouldn’t offer at all. And A Zia would always offer something, a cookie, a slice of pizza, bread and peppers, whatever was freshly baked and on-hand, during the entire visit. When we had our fill of sweets, as the visit would near its end, we would venture outside in the summer months to the rows and rows of raspberry bushes that grew in abundance next to the garden. 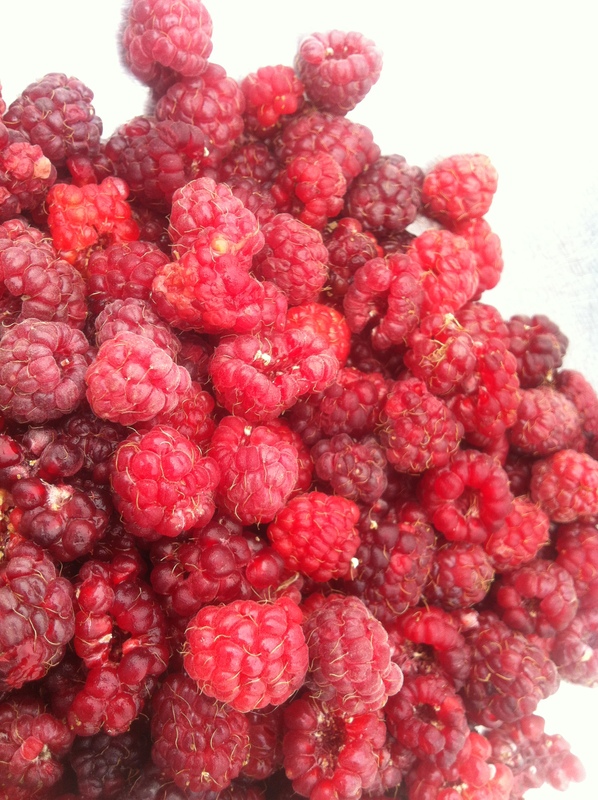 A Zia encouraged us to go to the bushes and eat as many raspberries that we could find, that we wanted. If you’ve ever grown raspberry bushes, you would know that they are the rabbits of the berry world. They reproduce like crazy, and if you pull a single raspberry bush properly, roots included, you can transplant it to another location where it will multiply and grow. That’s how we got our first raspberry bushes, from A Zia, the ones that grew wildly at the house I grew up in…and these, right here in this picture, are at our new house, all of which started with raspberry bushes from A Zia’s house. I still eat from the plants, just as I did over 25 years ago. 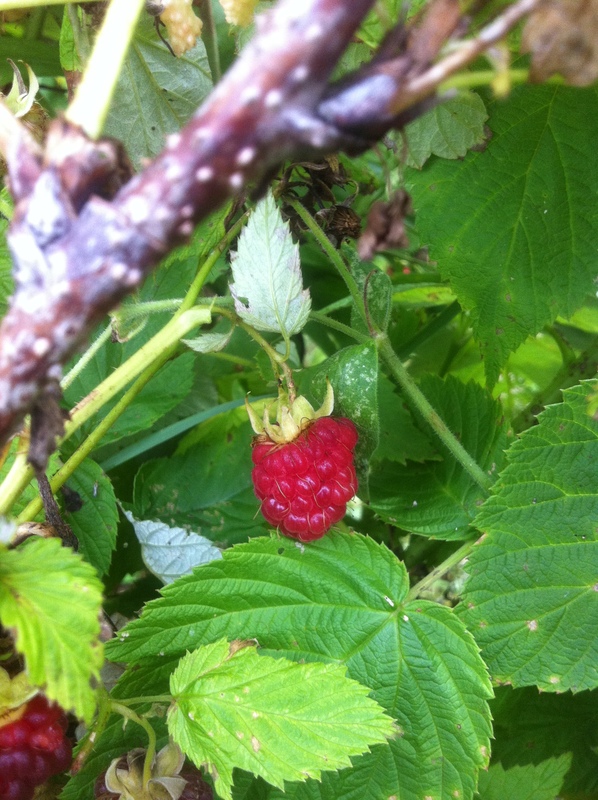 In the summer months, when my nephews visit, they run to the raspberry bushes and start picking and eating, just as we did as children, just as we all still do. And no matter how many we eat, there always seems to be an abundance, enough for me to add to fruit salads and desserts, like my Garden Fresh Raspberry Cheesecake. 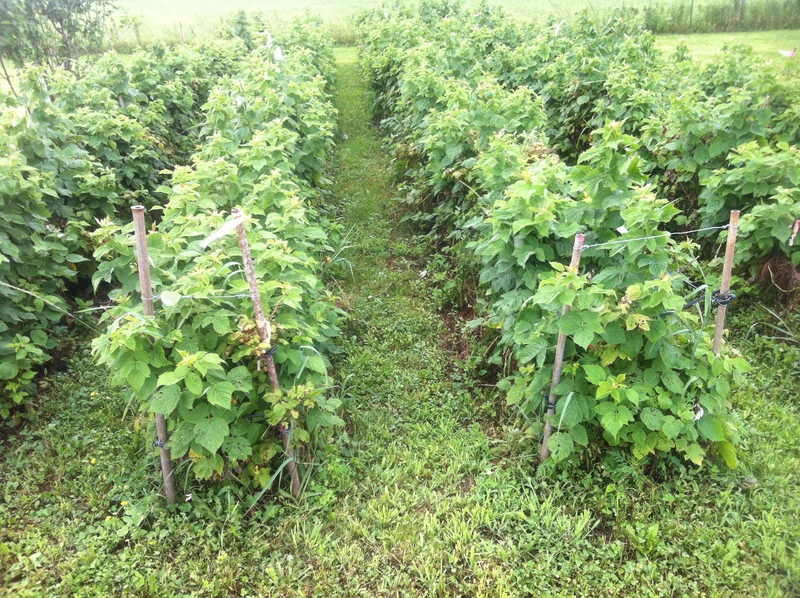 They survive the winters and grow with stronger resilience each year (these pictured are year 3 raspberry bushes). My Dad and I talk often of A Zia, especially when we see the raspberry bushes; They remind me of A Zia so much – her kindness, the abundance of food at her house, her bravery, and her resilient strength. Carlo, thank you for this wonderful tribute! It brought tears to my eyes and brought back many happy childhood memories. So happy to hear that you enjoyed reading it. We come from amazing tradition – so proud of our grandmothers for all that they taught us, gave us, and showed us! I shared this link on Facebook because I’m sure our family will want to read. Those raspberry bushes were in Aunt Rose’s garden and now Jimmy’s and ours. They grow so much better than any other we have tried. I love that a number of us have these raspberry bushes – It would be cool to bring ‘starters’ to next year’s reunion for others who don’t have any yet! All from one place, one of incredible love, where all of our stories began.